BUT WHAT IS ROCK IN OPPOSITION? Or rather, what was Rock in Opposition? Today, I want to draw in closer to ‘Rock in Opposition’ and outline what it is –or was. So, this post is something of a rough n’ ready primer. Those that are already familiar with Rock in Opposition can sit this one out and look forward to the next post, which will look back and celebrate the 1981 Raygun Commemorative Recommended Records catalogue. So, to begin at the beginning, one might jump back to March 12, 1978. This was the date of the first Rock in Opposition festival, held in London, England at the New London Theatre, and as such was the first public unveiling of Rock in Opposition. The festival was the first sprouting of a new tree, but the tree already had roots; the life of the oppositional tree had taken root underground and out of sight before March 12 ever rolled around. As the 1970s unfolded, the English band Henry Cow increasingly organized its touring schedule around mainland Europe. Back home in the UK, audiences were largely uninterested in their existence, primarily because they were unaware of their existence. The radicalized experimentation of Henry Cow’s contemporary rock-art didn’t fit well into the commercial categories that the corporate record industry was trying to nurture and develop. Consequently, Henry Cow, and bands like them, were filed in a bottom drawer and rarely saw the light of day. Virgin Records was to eventually drop Henry Cow from their roster because the Cows were not generating enough income for Virgin to warrant any substantial promotion. These cows were not cash cows. As a further consequence, Henry Cow began to take their own affairs into their own hands and started to carve out small networks and personal contacts around Europe on their own. These networks and contacts were inevitably forged with other bands who were also ‘not fitting’ neatly into the categories being developed, marketed and promoted by corporate industry. The ensuing result was that a small grouping of bands and like-minded co-conspirators were able to circumvent the corporate industry altogether and record, perform and distribute their music as they intended it, free of the programming dictates and ‘artist and repertoire’ concerns of a large record company. Remember that this is transpiring before the DIY ethos of the punk and new wave movements had washed in. 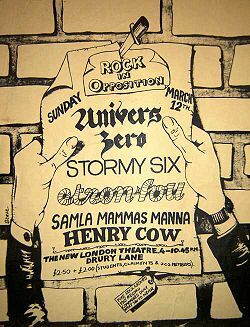 And so it was, on March 12, 1978, that the initiatives and cooperative efforts of these ‘outside’ bands coalesced into a full blown festival (called ‘Rock in Opposition’) and subsequently a functioning collective. The five bands that performed at this first festival were Henry Cow, Samlas Mammas Manna (from Sweden), Etron Fou Leloublan (from France), Stormy Six (from Italy), and UniversZero (from Belgium). It’s difficult to describe this ‘Rock in Opposition’ music, as it pertained to these five groups, precisely because the groups were not musically homogeneous. One could argue that the similarities they did share were more political and social in character than musical, except to say that musically each group was steeped in its own national cultural character rather than draped in the Anglo-American garb prevalent in the corporate commercial music world. I suppose that this too, however, could be counted as a political trait rather than a musical one. Following the festival, the bands continued to assist each other by setting up tours and contacts for each other in their respective countries. Then, in December of 1978, members of the five bands gathered together at Sunrise Studios in Switzerland (where a good number of records by Rock in Opposition bands were recorded) to discuss possibilities for the future. It was here that a sense of a formalized collective took shape. It was decided that new groups could be admitted into the collective under the following conditions – and here I am being skeletal: 1) musical excellence, as determined by the collective, 2) working outside the established, corporate music industry, 3) bearing a social commitment to rock music. Given these conditions, three new bands were admitted into the Rock in Opposition collective. They were Aksak Maboul, the Art Bears and Art Zoyd. By this time, Henry Cow had split up, so the collective stood at seven members. 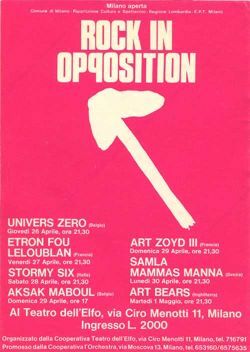 A second festival was held in late April-early May,1979 in Milan, Italy, at which all seven bands performed. Following the festival in Milan, the various member groups continued to assist each other in securing gigs and stayed in touch. But, since all of the bands involved were busy and heavily involved in their respective musical projects, the formalized aspects of being a collective began to loosen. I believe the Milan festival was the last time all of the RIO groups would be in attendance. In the words of Chris Cutler (Henry Cow, Art Bears), by the end of 1979 Rock in Opposition as a formal collective had slowly slipped away. The formal life of the Rock in Opposition movement, then, was relatively short. The name, however, would take on a life of its own and be used in various ways, usually to designate a particular kind of music, almost as if Rock in Opposition had been a genre. Bands such as Guapo, Thinking Plague, Present, or Miriodor have all been referred to as Rock in Opposition. Actually, many “progressive rock” bands exhibiting avant garde or experimental tendencies get labeled “RIO.” So, in the end, Rock in Opposition, or “RIO”, floats free, unhinged from the collective which originally ushered it into existence, and detached from any articulated program of social and political concerns, which is what sparked the original collective into being in the first place. Having said that, a recent annual Rock in Opposition festival in Carmaux, France seems to have picked up the torch and some of the rhetoric of the early manifestoes. There are bands emerging who have been nurtured by the music of the early Rock in Opposition bands, and it doesn’t hurt the cause that there have been recent re-stagings of the Art Bears, a resurgence of UniversZero and CD archival releases by bands with extended family links like The Work, Picchio Dal Pozzo and Radar Favourites. From all of these, old threads may be picked up anew. For those wanting to investigate Rock in Opposition and its history in greater detail, a more substantial and authoritative account can be found at ccutler.com (click on ‘interviews’). Also, back in 1979, the long-gone Impetus magazine devoted an entire issue (#9) to Rock in Opposition and the five original groups which constituted the collective. Good luck finding that though.